The photographer Christopher Herwig's book Soviet Bus Stops and its sequel Soviet Bus Stops Volume II lit up design and architecture blogs with their fascinating introduction to the world of bizarre public transport shelters in the middle of the Eurasian steppe. Enthusiasts of modernist architecture were wowed by the minimalist yet striking designs, while others were drawn in by the art - hundreds of images of Soviet workers, preserved in plaster bas-reliefs long after the empire had passed. These unique "small architectural forms", as they were known in Russian, are all over Kazakhstan, but in Almaty you can find a particularly beloved bus stop style that represents a unique form of folk art - the mosaic bus stop. From the 1970s to early 90s, dozens of bus stops were installed along Kazakhstani roads, mostly in Almaty province, that were covered in broken plates, teacups and teapots that had been collected from local ceramic and porcelain factories. The shards were assembled into delightful mosaics using a technique known as pique assiette, recycling what would have been industrial waste into delightful images of doves, smiling suns, galloping horses and abstract shapes. Every Almatian has enjoyed the comfort of these bus stops on a rainy day, but few know just how many there are and where they came from. In a couple of articles for the popular Kazakhstani online publications The Steppe and Vlast, Monumental Almaty teamed up with our friends at ArchCode to map these works of art and tell their story. Having familiarized the public with these architectural landmarks, ArchCode and Monumental Almaty now plan to take this research to the municipal authorities at Almaty's Akimat (City Hall) and work toward their preservation. Several stops have already been destroyed, and many are in dire need of renovation, tagged in graffiti and poorly maintained. 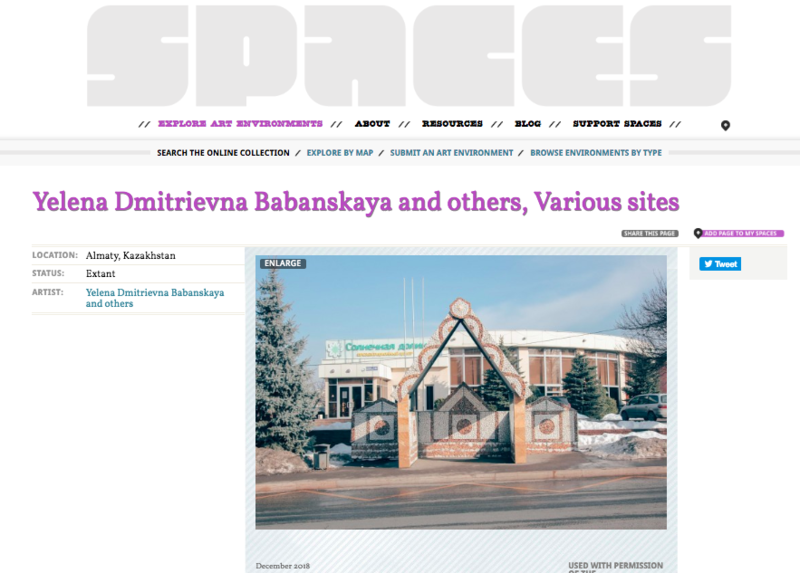 Ideally, the collection of Soviet bus stops would be be given city landmark status and set aside for protection. We were also able to get Almaty's mosaic bus stops accepted into SPACES, the world's largest register of art environments. These mosaic shelters are now listed side-by-side with folk art masterpieces as Watts Towers in Southern California and Nek Chand's Rock Garden in Chandigarh, India (both of which also used pique assiette). We hope that this brings more international attention to Almaty's mosaics and also helps convince local authorities that they have landmarks of international significance on their hands!